America: An Integrated Curriculum is a two-year literature-based American history program that consists of six 11-week studies. The first year of America is designed for 3rd-6th graders and the second year is designed for 4th-7th graders; parents/teachers are able to use it with multiple students in this grade range. This product includes Weeks 3-4 of the fourth of the six 11-week studies (Year 2). America: An Integrated Curriculum is an interactive program. 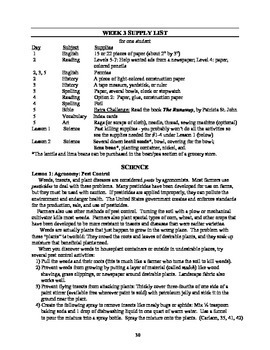 Both the teacher and the student use this copy of the manual. 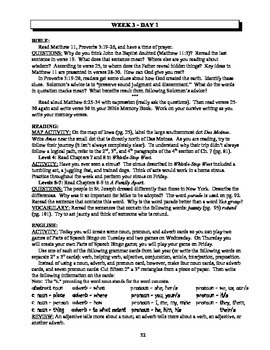 Notes to the teacher are printed with a gray background. If you prefer to print a copy for each of your students, click on "Add Multiple License" and you will be able to print more at a 50% discount. 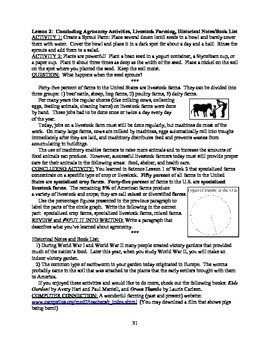 The focus of this program is reading and history, but it also includes the following subjects (everything except math) and an Answer Key: Vocabulary/Spelling, English Grammar, Writing, Geography, Music, Art, Crafts, Science, Health, Bible/Life Application, State Study, President Study, Timeline Figures.